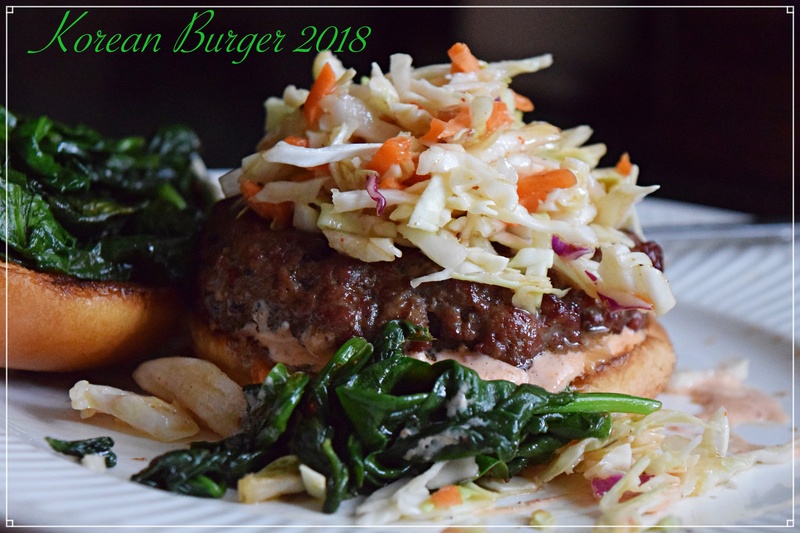 With the grilling season upon us and a fresh burger on the horizon for this beautiful day I chose to go a little/lot Asian for a change heading in the direction of a Korean style burger. Slightly on the perky spicy side of things, but not so much that your mouth is on fire, hey if Mike could finish the burger then that says something about the low-level of heat. He did mention that he got a little heat, but I think that it was the slaw to which I added the Korean chile spice powder, but come on slaw can be pretty blah, it needed something and the addition of Korean BBQ sauce and chile pepper was just right to me. I had previously made a good old southern vinegar based dressing (Leite’s) so I decided to use that with the two additions to perk it up. Of course, I followed some basic Korean seasoning additions and plucking from several recipes online I made what I thought tasted like what I wanted, nothing really authentic, but really good. It might be overkill, but I sautéed a little spinach with garlic and sesame oil..oops that might have been the heat culprit since I ran out of toasted sesame oil and used a drizzle of the hot version…have the spinach on the side, or like me on the burger, quite messy as a burger should be! A good basic Korean BBQ sauce is an important ingredient and rather easy to make and keep for other Korean style dishes, especially grilled meats, I still had enough left from my last Korean craving day so I finished that off for the burgers and even added some to the coleslaw that I had prepped. Several homemade versions are out there, but feel free to use a store-bought version. Fluff the ground beef with a large serving fork add each ingredient a little at a time, tossing after each ingredient, I might do this in three installments to get the seasonings totally incorporated. From here you can form any sized burger that you want we had slider-sized burgers so I actually weigh out the burger in ounces to make them as equal as possible, but go for a larger burger if you wish. Trim, then shred the white cabbage, leek, and carrot, then mix together in a bowl. Add the remaining ingredients and mix – it can be eaten straight away and will keep fresh in the fridge for 1 week.